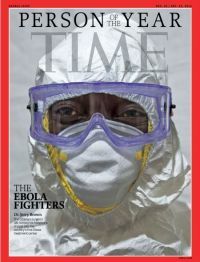 Ebola Fighters – TIME’s Person of the Year 2014. Strong effect, influence, generation of new ideas, thrust for new vistas of investigations, favorable impressions, clear course & direction to work, combine to make the ” Ebola Fighters ” collectively adorn the title of the ‘TIME’s Person of Year 2014’ with significance and entitlement. Citizens of the world will stand to feel their self-esteem enhanced with the exciting sense of credit showered on them. The task is to pick who ( individually or collectively ) represent the news of the Year. The pick needs to have archival value. It has to stand the test of time. A force of history, it needs to be. Ebola Fighters remain and represent true to every cited regulation. Ebola Fighters’ tireless acts of Courage and Mercy; and for risking, persisting, sacrificing and saving lives are fully and truly acknowledged. The spirit of ‘never say die, not quitting’ even while their colleagues fell ill and died comforted patients to a great extent. I submit that Ebola Health Threat and the combative efforts helped open new vistas of investigation(s) and containment actions at the rate of knots from a diverse group of professionals and groups. 1. Health Care Threats like Ebola where the potential of the outbreak to last, spread, and engulf a larger area and population for a period challenging the control process that becomes a daunting duel testing the powers and capabilities of the ” Management ” are huge. 2. It brought together specialists in varied fields of Medicine, Paramedics, Management, Computer Science, Information Technology, Mobile Carriers, Government , Non-government Organizations, and even common citizenry. 3. The task of containment involved detailed descriptions of various locations of Ebola stricken patients, the problems they encountered, the resources/health care/ supplies like soaps needed immediately – a huge amount of data processing in fact. 4. A new dimension in Technology emerged fusing Robotics and Cloud Computing. Super computing and analytics technologies including Big Data and Cloud helped in the ‘portrayal’ of “trends” based on all information gathered which was to prove critical in combative efforts now and in to the future. Cloud learning saw a leap forward. 5. A flurry of research activities in laboratories, awakening initiatives, actions tracking people suspected of having contracted the virus pouring in TV broadcasts, magazines and internet were initiated and speeded up. 6. It induced Institutions, Health Organizations, Laboratories, and Survey Portals to gear up in contribution to the Containment process. 7. It spurred the Center for Disease Control ( CDC ) in U.S.A. to issue fresh guidelines categorizing the probability of risk with alacrity. In sum, the people involved were not just BRAVE but much above AWARD SEEKERS. This, perhaps, is the decisive factor and judicious observation that marked the selection of Ebola Fighters worthy of the “title” of ‘ TIME’s Person of the Year 2014 ‘. A justified title to the deserving, harmonious, school of Individuals indeed.